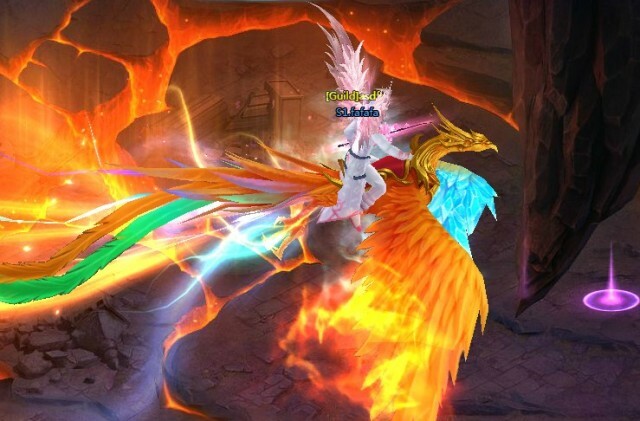 New Mount Prismatic Phoenix Comes to Sapphire! Prismatic Phoenix, the ancient bird and absolute being, has risen from the ashes and has come to Sapphire! She is the embodiment of the Holy Fire and was born with the power to destroy the world. In order to restrain her own power, she sealed one of her wings with ice. Despite this, her flame still demands both respect and fear. On the other hand, the mercy and compassion she has for the world is manifested in her power to protect and heal allies. At the start of battle, increase max HP of the entire squad by 9.75% and ATK/DEF of the entire squad by 19.5% for 5 turns; also heals the entire squad for 10% HP each turn for 6 turns. Increase max HP and DEF of the entire squad by 14% of the caster's max HP and DEF; after taking fatal damage, you have a 31.25% chance to revive with 30% HP (only once per battle). Prismatic Phoenix will be available in Treasure Grab from Apr. 23rd to Apr. 25th! Seize the chance to claim this Godly Bird and bring about new storms in Sapphire! The anniversary party of LOA II is still going on, stay turned for our latest update! Hope you enjoy the Birthday Carnival and all the new contents in LoA II! Next：New HKT Server coming on Apr 18th and GMT Server on 26th!